Indictment filed against Sudanese man who stabbed nurse in apparent revenge attack against Shmuel HaRofeh hospital. The State Prosecutor's Office filed an indictment against Osher Bakhit, who stabbed a nurse at Shmuel Harofeh Hospital. 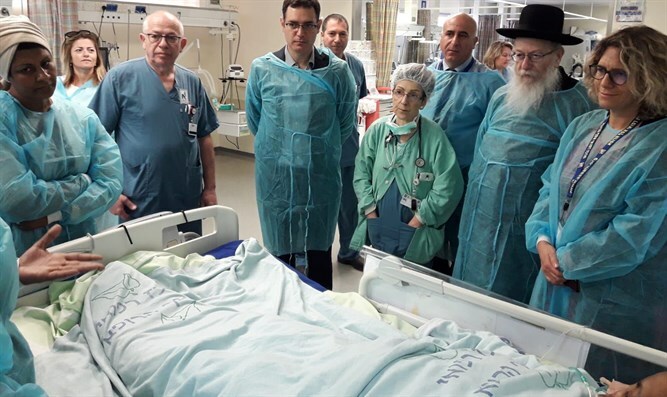 Bakhit, a resident of Sudan with a temporary permit to visit Israel, was previously hospitalized in the Geriatric Medical Center "Shmuel HaRofeh." He had expressed anger at the hospital for a variety of reasons prior to the attack. At the beginning of July Bakhit arrived at the hospital with a knife in his pants, in order to harm any member of the hospital staff he could find. He entered the hospital compound in violation of the security guards 'instructions and headed for the nurses' station, where a nurse was working. One of the security guards approached Bakhit, but he pulled the knife out, raised it with a threatening gesture towards him and said, "Come, come here." Bakhit entered the nurses' station with the knife, approached the nurse, raised his hand, and stabbed in the stomach. The nurse fell to the ground and took Bakhit's hand to prevent him from stabbing her again. The security guard raised his gun at Bakhit and ordered him to drop the knife. Bakhit did not respond to the guard's orders until he fired a warning shot at the floor. Bakhit then threw the knife on the floor and was subdued. The wounded nurse was hospitalized.